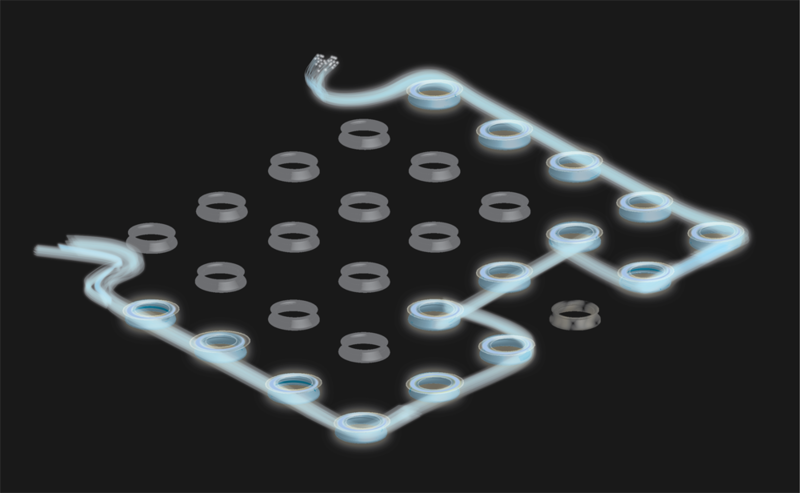 Image depicts photonic edge state in a 2D array of resonators. Transmission of light is protected from defects because the system exhibits a photonic version of the quantum spin Hall effect. Information traveling near the speed of light always sounds a little like science fiction. But this is what we get whenever we connect to the internet or watch cable television. Small packets of light called photons travel kilometers over networks of optical fiber, bringing information into our homes. If fiber optic cable is ideal for carrying information, why haven’t photons replaced electrons entirely? Largely because miniaturizing photonic equipment all the way down micrometer scales often degrades their performance. Manipulating photons such that they behave like their electrical counterparts- the electron- is a rich area of research with applications extending into quantum information and condensed matter. Scientists are proposing a novel method for forcing photons to act like electrons. Two researchers at the Joint Quantum Institute (JQI), Mohammad Hafezi and Jacob M. Taylor, and two researchers at Harvard, Eugene A. Demler and Mikhail D. Lukin, propose an optical delay line that could fit onto a computer chip. Delay lines, added to postpone a photon’s arrival, are passive, but critical in processing signals. Kilometers of glass fiber are easily obtained, but fabricating optical elements that can fit on a single chip creates defects that can lead to reduced transmission of information.